Before becoming a mom, I didn’t know just how much dishes a parent has to do for the rest of her life. I’ve never been the one to hate cleaning. In fact, I actually enjoy cleaning for the feeling it brings me afterwards. But when one is doing dishes and cleaning multiple times a day for over ten years, it can become quite the chore. In my daily life as a mom of 3 growing kids, dishes have become an important part of my day whether I enjoy it or not. It’s a chore that is never-ending and unavoidable and unless I’m okay with eating off paper plates for the rest of my life (which I’m not), dishwashing is a task I must accept, embrace and even find joy in. Today I want to share my simple tips to make doing dishes more enjoyable. As many of you know, I’m on a clean living journey to always choose the better and more eco-friendly and bio-based* products in the home. 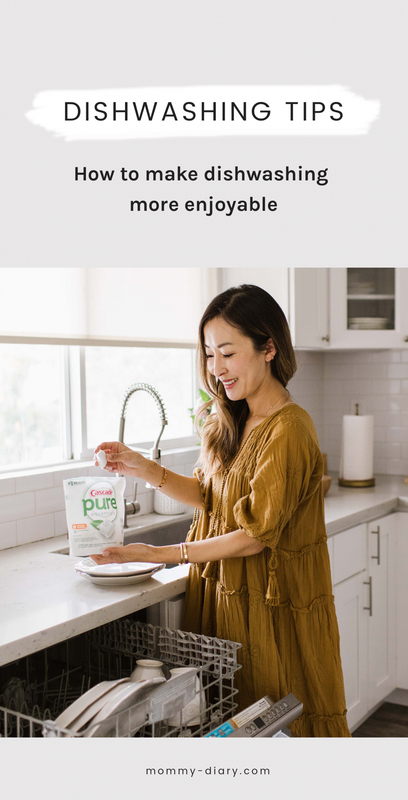 With that in mind, Cascade has developed new pure essentials which offers a dependable clean with a simplified formula that meets the needs of today’s families. 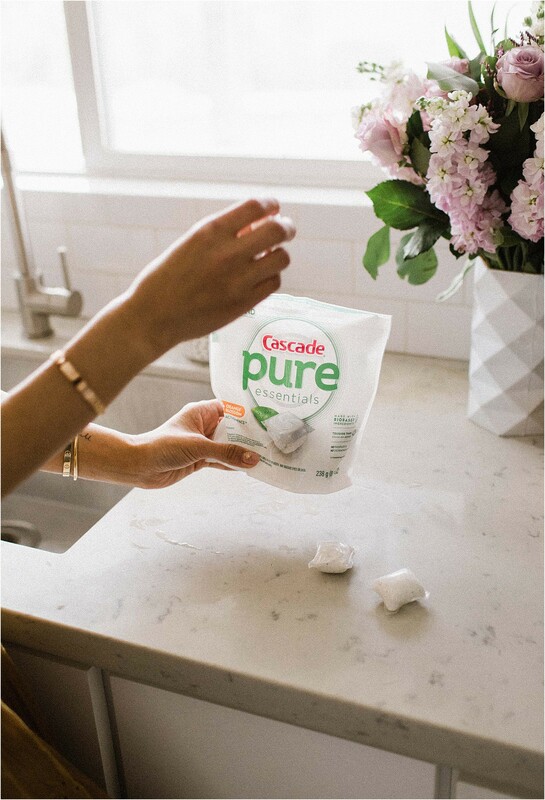 From a brand you already know and trust, new Cascade pure essentials is free of phosphates and chlorine bleach but chock-full of the power needed to get your dishes and silverware sparkling. 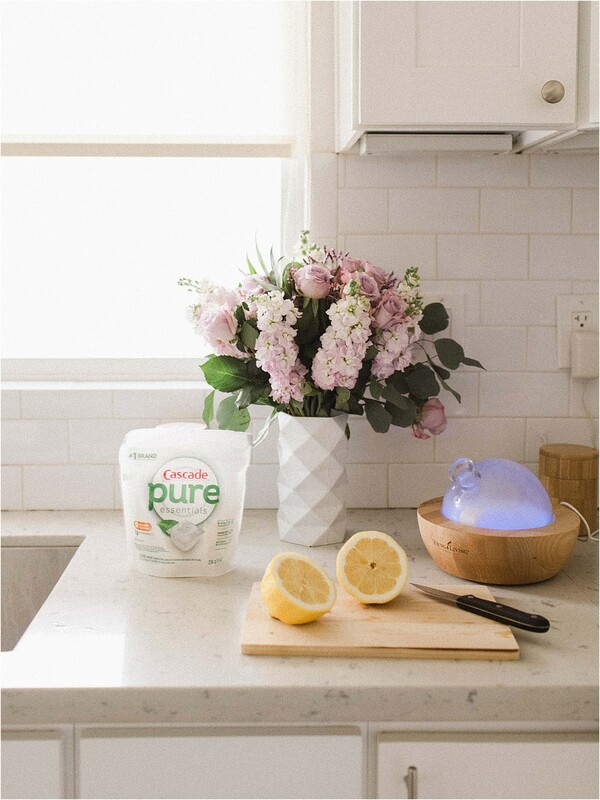 I like using Cascade pure essentials because it is infused with essential oils and offer a fresh citrus scent. It’s also Cascade’s only dye-free liquid top. Once I realized how much time I was spending doing dishes, I decided to use this time to take a mental break from the demands of motherhood and work. I like to diffuse essential oils while doing dishes because its therapeutic aroma fills my space and heart with relaxing and peaceful thoughts. Instead of thinking about dishes as a dreaded chore, I shift my perspective and say I’m thankful I get to do the dishes for my family. I even thank my dishwasher and dishwashing detergent for being present to make my life easier. Can you imagine how much harder doing dishes will be without these valuable tools? A simple change in perspective can make the most dreaded chore an act of gratitude. I believe assigning daily chores for our kids is imperative to teach them responsibility, accountability and a sense of community. My tween daughter knows that I expect her to help around the house as needed, including watching over her little brother, fixing her own simple afternoon snacks and helping me with dishes and other cleaning as needed. I love watching her grow into a responsible and kind young lady. I also enjoy using our time together to catch up on school stories and latest fashion trends for tweens. As you can see, doing dishes doesn’t have to be a dreaded task. 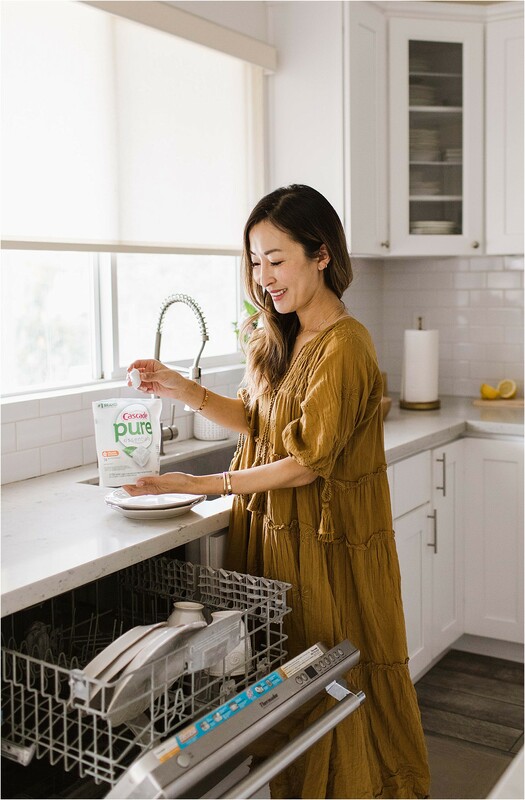 Next time you’re shopping for new dishwasher detergent for your family, give Cascade pure essentials a try. It makes my dishes sparkling clean with a fresh citrus scent that is not overpowering. I also love that it is infused with essential oils, my latest obsession! What do you think about my tips for making daily household tasks more enjoyable? Are you mindful about which products you use in the home? I am going to have to try those tablets. Thanks for sharing. I like the tips. Never thought about doing selfcare while doing the dishes. I have a love/hate reLationship with dishwashing! We handwash most of our dishes and It is rAther relaxing for me, but so time consuming. I couldn’t imagine with three kiddos! I actually love doing the dishes–i prefer to do it over pretty much any other chore! i also love the idea of taking a few minutes to practice self-care and postive thoughts during this time. Great tips! And cascade is my fave too! I love listening to podcasts when i do the dishes! makes the time go by much faster! Washing dishes is my least faVorite chore. Thank you for these tips. I don’t enjoy dishwashing at all – but maybe these tips will help! We’ll see – it’s just not my favorite chore. 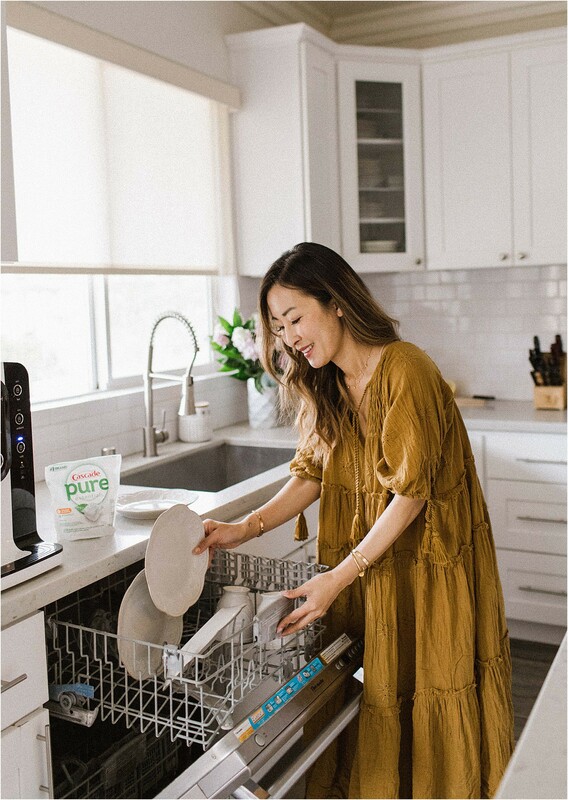 I rarely wash dishes In my House, my parTner takes on that RESPONSIBILITY lol however, cascade is my FAVORITE brand of detergent to use! I like your sUggestion to thank the dishes. Very marie kondo! And essential oils are so nice to help your mood too! I love this. I agree teaching children to be responsible through chores is so important. I also love your blog!